File Types: JPG,EPS,All Files; File Size: 811.1 KB; Requirements: Adobe CS1+; Vector: Yes. Girl swinging on a tree rope swing. Kid childhood happiness. Modern flat vector illustration clipart. 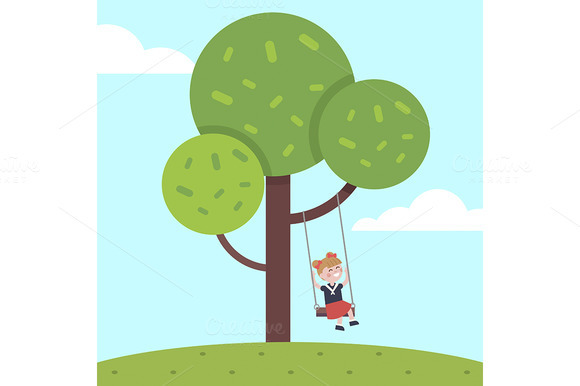 Keywords: flat, icon, vector, isolated, illustration, symbol, sign, concept, object, template, white, background, design, cartoon, metaphor, clipart, character, person, people, kid, child, small, children, childhood, infant, play, fun, joyful, joy, cute, youth, young, smiling, caucasian, cheerful, human, girl, female, woman, daughter, lady, schoolgirl, school, preschool, schoolchild, student, elementary, grade, first grader, activity, playing, game, entertainment, amusement, playful, enjoyment, happiness, recreation, pleasure, pastime, outdoors, open air, nature, forest, woodland, public, park, garden, fresh, grass, vacation, adventure, holiday, tree, sky, big, blue, swing, wooden, rope, wood.